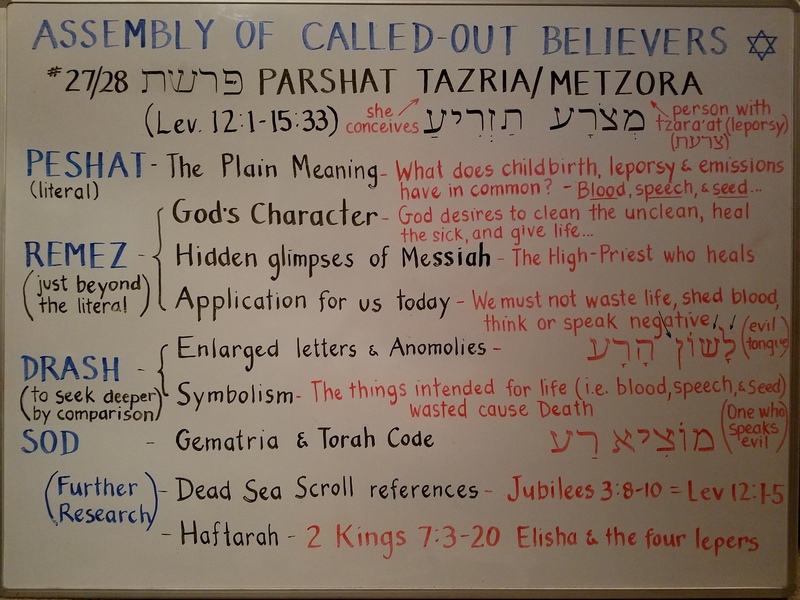 Metzora or M’tzora, (מְּצֹרָע‎) — Hebrew for “one being diseased,” the ninth word, and the first distinctive word, in the parashah) is the 28th weekly Torah portion (פָּרָשָׁה‎, parashah) in the annual Jewish cycle of Torah reading and the fifth in the Book of Leviticus. The parasha deals with ritual impurity. 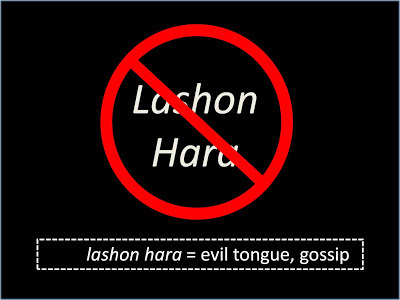 It addresses cleansing from skin disease (צָּרַעַת‎, tzara’at), houses with an eruptive plague, a spiritual sickness caused by “lashon hara” an “evil tongue” of slander or gossip. The parashah constitutes Leviticus 14:1–15:33. The Parshahs of Tazria and Metzora continue the discussion of the laws of tumah v’taharah, ritual impurity and purity. A woman giving birth should undergo a process of purification, which includes immersing in a mikvah (a naturally gathered pool of water) and bringing offerings to the Holy Temple. All male infants are to be circumcised on the eighth day of life. Tzaraat (often mistranslated as “leprosy”) is a supra-natural plague, which can afflict people as well as garments or homes. If white or pink patches appear on a person’s skin (dark pink or dark green in garments or homes), a kohen is summoned. Judging by various signs, such as an increase in size of the afflicted area after a seven-day quarantine, the kohen pronounces it tamei (impure) or tahor (pure). A person afflicted with tzaraat must dwell alone outside of the camp (or city) until he is healed. The afflicted area in a garment or home must be removed; if the tzaraat recurs, the entire garment or home must be destroyed. When the metzora (“leper”) heals, he or she is purified by the kohen with a special procedure involving two birds, spring water in an earthen vessel, a piece of cedar wood, a scarlet thread and a bundle of hyssop. The interesting thing about the ritualistic cleansing and cure for metzora ( the physical manifestation of a spiritual sickness) caused by an evil tongue is that it is the same ritual performed for the anointing the High Priest before his intercessory work for his brothers in Israel began. This teaches us that if we are to be true intercessors for one another we can have no evil thoughts or even negativity leading to negative words against our fellow man, if we are to be an apt intercessor and priest in messiah’s Kingdom! The word is likened unto the seed and life and thus ritual impurity is also engendered through a seminal or other discharge in a man (i.e. the seed), and menstruation or other discharge of blood in a woman (the life), necessitating purification through immersion in a mikvah. This week’s haftorah discusses the story of four men stricken by tzara’at, a skin ailment caused by sins — one of the main topics of this week’s Torah reading. Now, four men suffering from tzara’at dwelled in quarantine outside the city. They too were hungry, victims of the famine. They decided to approach the enemy camp to beg for food. They arrived only to find a deserted camp. For “G‑d had caused the Aramean camp to hear the sound of chariots and the sound of horses, the sound of a great army. And they said to one another, ‘Behold, the king of Israel has hired against us the kings of the Hittites and the kings of the Egyptians to attack us. '” The entire enemy army fled, leaving behind their tents, horses, donkeys and provisions. The four men went to the city and reported their findings to the gatekeepers who, in turn, informed King Jehoram. Though originally thinking that this was an ambush planned by the enemy, the king sent messengers who confirmed the miracle. The people swarmed out of the city and looted the enemy camp, thus breaking the famine and fulfilling Elisha’s prophecy. And the officer? The king placed him in charge of the city gates. He was trampled to death by the rampaging crowds — after seeing the fulfillment of the prophet’s words. Write us and let us know what you think! We hope this Torah and Haftarah teaching blesses you in your spiritual understanding and growth! Also if you have a need for prayer, please write us and let us know how to pray for you and we feel privileged to be intercessors in prayer for all our worldwide family! Well done my Son! May G-d Bless and Keep You! Thank you immensely for sharing a power message with our family, Pastor Isaac! Cheers to exploding our God’s infinite mystery, depths of wisdom, perfect holiness, eternal love, supernatural grace, transcendent delight, and so much more of His infinite awesomeness! We have only scratched the tip of the tip of the tip of the massive iceberg of His eternal superiority!